Minitokyo »	Inuyasha Wallpapers » Inuyasha Wallpaper: Swords Crossed! I was actually making this for Scenic but then my HDD crashed and I got mad about it. When I finally bought a new HDD my school year started and my free time went back to none. Anyways. I picked up a generally small image that I always wanted to have on my desktop. Of course I wasn't able to find a bigger version of it so I vectored Sesshoumaru and Inuyasha, painted the trees, added some blur for the movement... and welp, done. Saw this on AP! Very very neatly vectored and I love the trees. Great job! 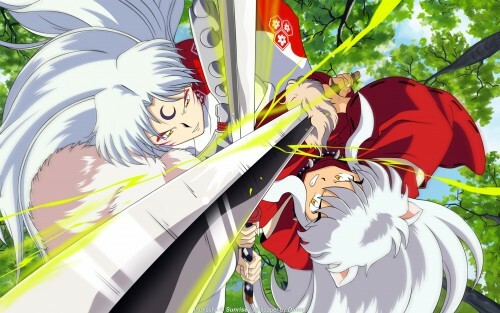 Wohoo, go Sessh, even single handed (literally) you still own Inuyasha! Would you care to join Sessh-Luvin? why does sessh have two hands? Wow this fight is great and gripping! One of the few Inu Yasha wallpapers, and one of the best. Very nicely done, from what you've had to work with, and definitely a nice shot to have on the desktop for the anime fans. Great coloring, and amazing trees, job well done, credit well deserved. wow, excelent, a love sesshomaru-sama,thanks! this wallpapers is amazing, thank you! nice! i like their expressions! Beautiful! I love when these 2 fight!